- Detholz! - New waveish stuff influenced by the likes of Devo and Talking Heads. - Aleks & the Drummer - Aleks Andra Tomaszewska delivers surf farfisa and icy vocals over Deric Criss's pulsing drums to create something that sounds kind of like slightly spooky, out of control video game music. - The Hood Internet - Chicago's always fun indie mash-up kings. A night of true festive imitation done rock 'n' roll style, featuring Dead Electric as AC/DC, The Bon Mots as Heart, Fringe Benefits as The Cars, Phil Angotti as The Who, Nick Tremulis as The New York Dolls, John Aselin as Tommy James and the Shondells and Avalanche Rescue Team as The Smiths. Whew. 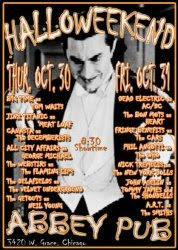 There's also a show on Friday, October 30, with different bands as different bands. See here for details. Conor Oberst & the Mystic Valley Band with All Smiles. "Halloween Gets Heavy at the Hideout"
For the metalheads and those who want to be metalheads for Halloween, the Hideout will fulfill your gritty desires with Indian and Rabid Rabbit. The King Khan & BBQ Show, The Goblins, CoCoCOMA and Women.